Give yourself some options! Don't settle for just soup, get a tasty salad, too, with this lunch kit. Inside the bolt kooler bag is a 24 oz. 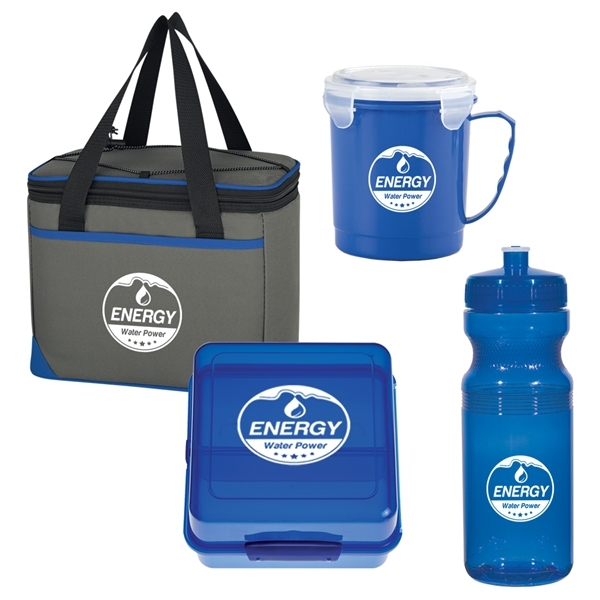 food container mug, silicone collapsible set, and a Poly-Clear™24 oz. fitness bottle. Recipients will be the envy of their coworkers with such a fine collection. Silkscreen or transfer your logo in one color to one location on each item so that everyone knows where to find great quality items! Imprint Size:8" x 4", 2" x 1 1/4", 3", 3" x 3", 3 3/4" x 3", 5 3/4" x 3"